A. edmundsii 'Rosy Dawn' is a Ken Taylor introduction from the central California coast that stays low and spreads. Flower clusters are small, with many light pink flowers. 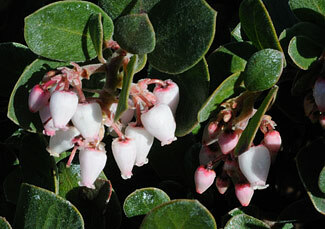 The species is more drought and heat-tolerant than the more popular bearberry, A.uva-ursi. Sun, well drained soil, occasional to little supplemental watering once established.